I have resigned my role in ATX Hack for Change and will not be attending. More importantly, you should not attend either. When we started ATX Hack for Change as part of the National Day of Civic Hacking, we started with the premise that there are smart people on both sides: people who know the tech but don’t know the problems and people who know the problems but don’t know the tech. If we put them together with some planning and structure, great things would result. So far we’ve been proven correct facilitating services to help feed the homeless, organize Girl Scouts’ merit badges, and help people understand their local government better. In our 3rd year (May 2015), I served as MC for the weekend and introduced Mayor Adler for his welcome keynote. He gave a honest and sincere address about Austin being a great place but having problems that we need to solve together, one of the biggest being transportation. I was excited and impressed. The City of Austin is the hot girl from high school who wanted you to do her homework and then just go away. Fast forward another six months when Proposition 1 failed. I was frustrated but accepted it. May 7th — Proposition 1 vote fails. May 9th — Uber and Lyft end service in Austin. Immediately various “Gypsy car” services pop up. Some are just random guys posting to Craigslist. Even the “official” services backed by the city are run by a guy parked behind a gas station and NONE of those comply with the law. May 16th — The City of Austin announces three job fairs in one week for now-unemployed Uber & Lyft drivers. May 19th — The City Council passes a resolution to invest in Uber and Lyft’s competitors. Councilwoman Troxclair — one of the few who gets it — tries to amend it to require compliance with the law. Mayor Adler rejects it. May 20th — Mayor Adler points out that they never expected these companies to comply with the law. So wait, the entire goal of this is to regulate online commerce? No wait, Tinder isn’t commerce. So this is to regulate any online interactions? Since I raised these issues, I was informed that I should have attended the secret off-the-record dinner with Mayor Adler last week. I declined because public policy feedback and debate shouldn’t be secret unless you have something to hide. This is no longer about Prop 1. This is about a Mayor and Council that talks transparency and innovation… as long as they think we’re looking. But once we stop, they cut backroom deals and encourage people to break the laws they wrote. So as much as I have loved working on and attending ATX Hack for Change for the past four years, I’m done. I won’t be used as a prop in this scam. 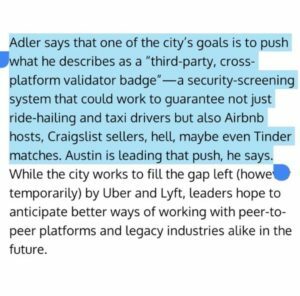 I feel bad for the many people who work for the City and groups like Open Austin who “get it” and want Austin to be a welcoming place for business, tech, and innovation.. they’ve been lied to even worse than the rest of us.